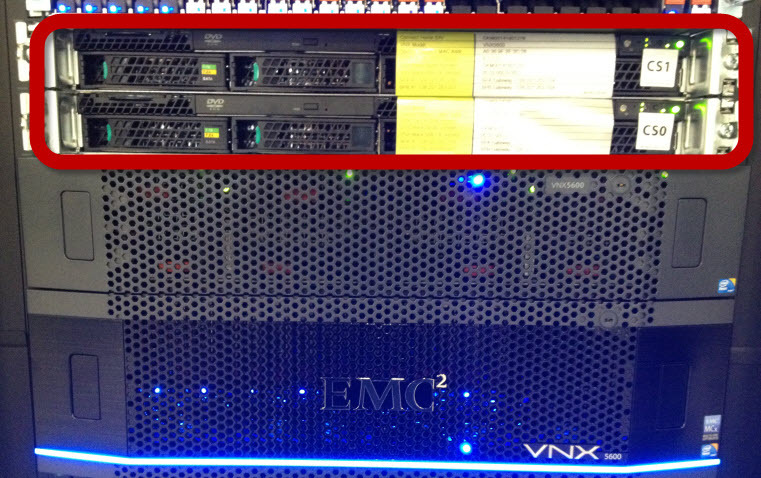 These were just some of the highlights from the Second Generation VNX Launch. In this post we will take a look at some of the changes in hardware focusing on DPE, SPE and the new CS. 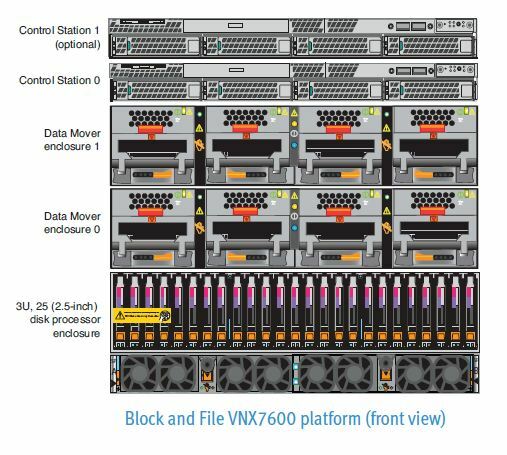 The full range of VNX Models have been rearchitected with new hardware and software. 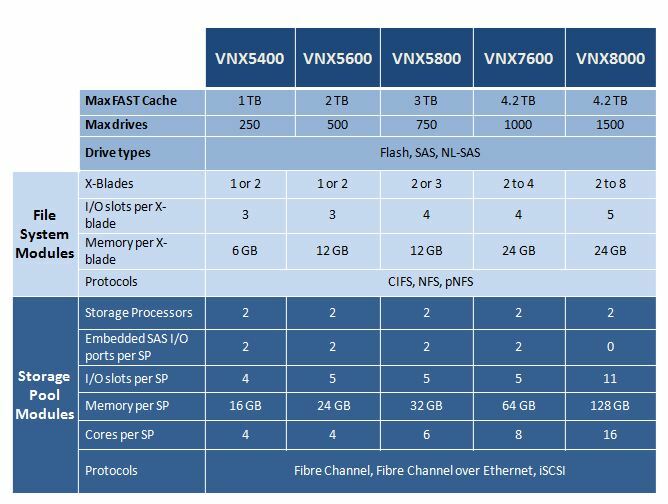 The VNX OE releases are codenamed after mountain ranges with this latest release codenamed “Rockies”, more on VNX code naming schemes can be found on Chads blog post: EMC VNX Inyo: “Hello World!”. There is a new 3U Disk Processor Enclosure (DPE) containing two SPs with 25×2.5″ drives. This DPE (Jetfire) will be used in the 5400 to 7600 systems. As can be seen above there are different processing capabilities dependent on the model. Two 1100W power supplies, one per CPU module. Four fan packs, two per CPU module – Torque Limiting Screw (TLS) for removal/insertion. 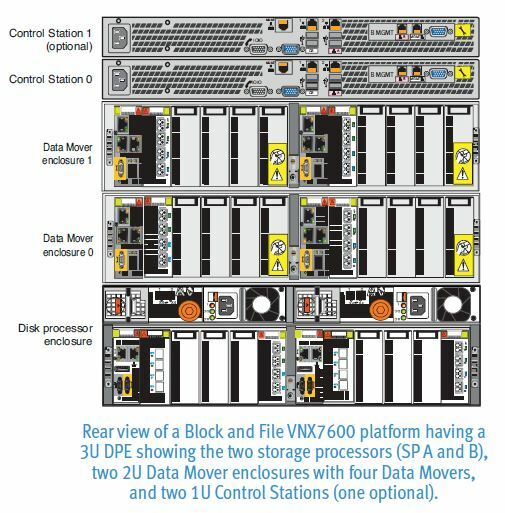 For the 8000 model there is a new 4U Storage Processor Enclosure (SPE) that holds the two SP’s. 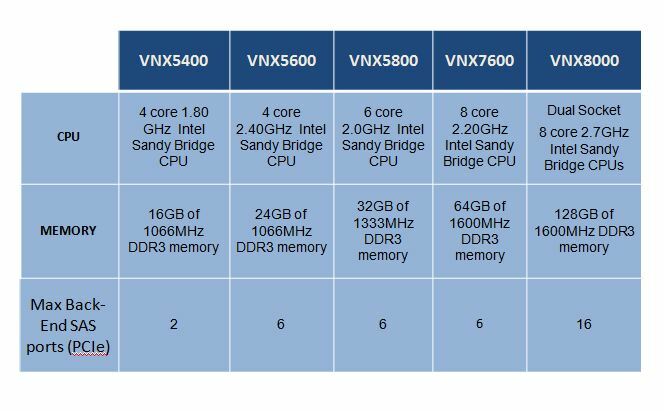 Each SP consisting of 2x8core 2.7GHz Intel Sandy Bridge CPUs (16Cores Total), 128GB of 1600MHz DDR3 memory, 11 I/O PCI-E Gen3 slots with 9 slots supporting FC, FCoE, and iSCSI and the other 2 slots reserved for back-end connectivity. 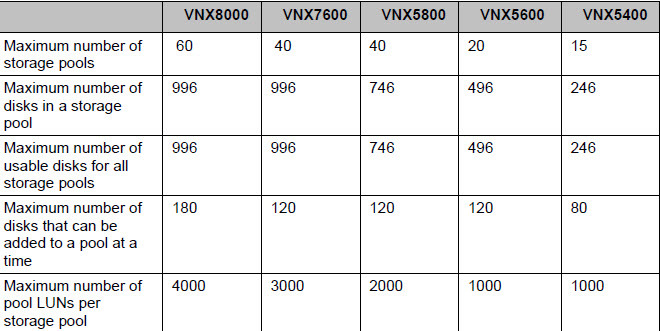 An update to the SP OS allowed for these greater memory configurations. 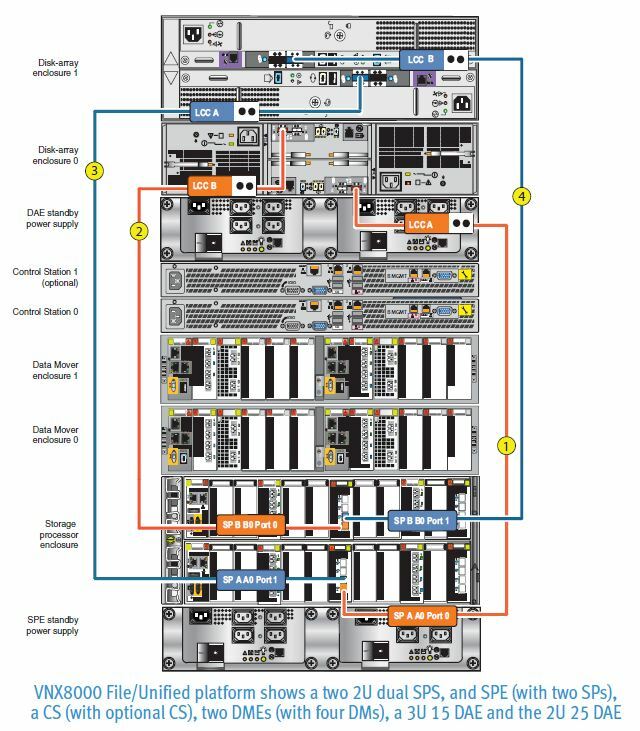 This gives a total of 32 cores, 22 I/O Slots and 256GB of memory across the 2 SPs if you compare this to a VNX7500 which has 12 cores, 10 PCI-E Gen2 I/O slots and 96GB of memory you have a serious increase in performance. Two 2U dual Li-Ion SPSs are also included with One SPS dedicated to the Megatron SPE and the other one used for vault DAE. 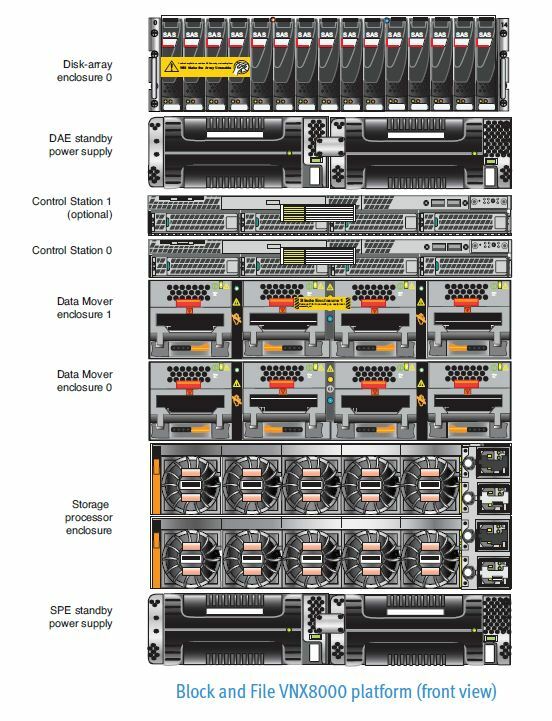 The new 1U Control Station codenamed “Dobie” is an upgrade from the Maynard CS providing enahanced Unisphere performance using a multi core processor: 4 Core 3.1GHz Xeon CPU and 8GB memory. The same Dobie CS will be used across all models. File side connectivity continues to be provided for by the Argonaut X-Blades.